Here in the Pacific Northwest, we have many Douglas Fir trees. Tall, thick-barked, resistant to fires, they can live up to 1000 years. As I was walking in the Grand Forest with many Douglas Firs, I ran into someone who shared the following story with me. Legend has it that a long time ago, there was a large forest filled with many trees and animals. During a thunderstorm, lightning struck a tree and started a forest fire. Terrified, the animals started fleeing the forest to find safety. One small mouse was running as fast as it could, but soon realized it would not be able to outrun the fire. It approached several trees, asking for help, but each tree told the mouse that they couldn't help, as they would soon be engulfed by the flames. So the mouse did as it was told, and the rest of the mice followed suit. 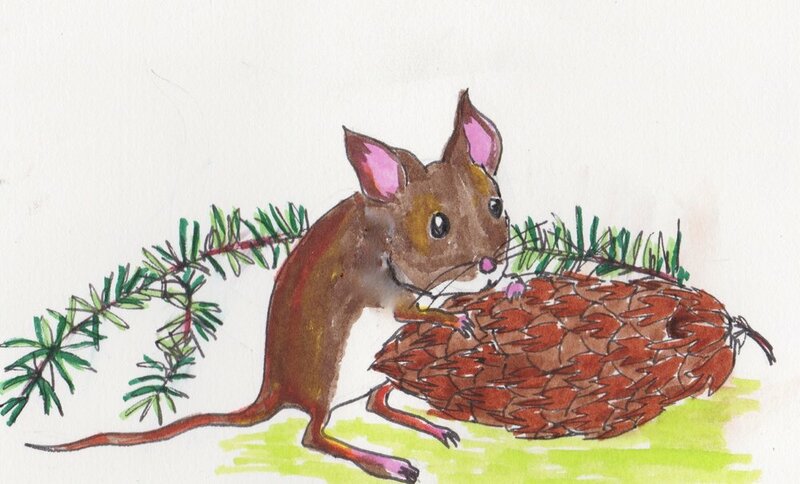 The forest fire ran its course and the Douglas Fir survived, as did the mice. To this day, if you look at the cones of a Douglas Fir, you can see the tails of mice hiding inside the cones. I was once told that I tend to get in my own way. What on earth does that mean? How can I get in my own way, there's just one of me and I only have two feet? How is this possible? It took me several years to understand that this was a reference to anxieties and self-doubts. We all have them. Some of us handle them better than others. I'm still learning, but stumbled across this diagram ( published by John Saddington) and found it to be very reassuring. The theory is that any idea will go through several stages, each one being a normal part of the process. What I love about this is this: all great ideas are supposed to feel like they're terrible ones during the development process. It's normal to get discouraged and want to quit. As I've worked on paintings and my art business, some ideas barely skimmed the deep swamp of despair, but several ideas have gotten lost there. I've found myself wallowing about in the muck, having my own personal pity party. But the strength of any work, or of any person, is the will and perseverance to get back up and out of the swamp. To keep moving forward, even when you're not sure where you'll end up. In my work, a painting only gets really good once I successfully negotiate the swamp of despair. Every time I stick it out, I come out the other side with a new learning, a new way of creating work and more confidence. It's a great lesson for many other areas of life: building an exercise habit, changing eating habits, growing a business. Just knowing that the dark swamp of despair is part of the journey and not a call to quit makes it a little easier to get back up and keep working. 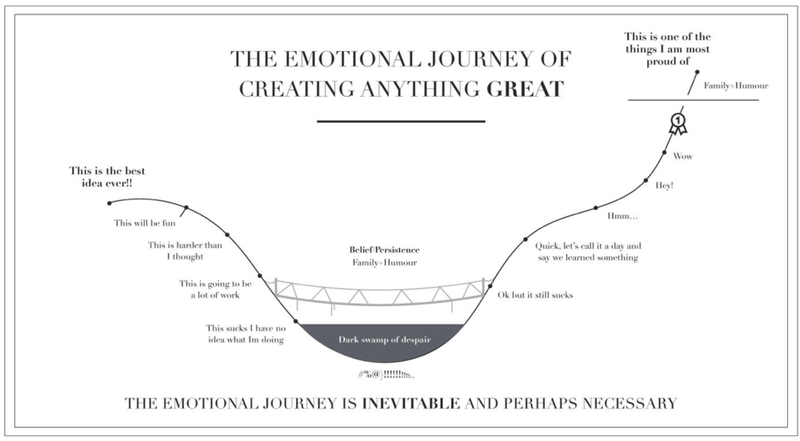 I keep this emotional journey diagram in my kitchen where I can see it. When I'm procrastinating and binge-watching Netflix, I look towards my pantry and see this reminder: step away from the computer, it's time to get back to work! There’s a certain amount of truth to that story. Like any skilled person, most artists have many years of education and dedicated practice behind them in order to perfect their craft. They have dug deep to make work that expresses their unique voice, invested in a studio, studio materials and a studio practice. What you won’t see in a gallery or show are the ‘misses’ or pieces that didn’t make the cut. You’re just seeing the tip of the iceberg. Making art can be hard. But not making art is harder. That’s why I’m so grateful for all of my subscribers and followers who support this work. Thank you for your kind words and supportive actions. You make this work meaningful! It’s so exciting! This year, I’ve been accepted into the Bainbridge Island Winter Studio Tour. The Tour consists of 60 juried artists showing and selling work in eight central locations around the island. Artists include visual artists, ceramics, jewelry, one-of-a-kind clothing, woodworkers, glassworkers, photographers, musicians, metal artists, and other disciplines. If you’re in the Seattle metro area, please consider this an invitation to come by for a visit, taste some baked goods (you know how I love to bake) and enjoy a warm conversation. Take a ride on the ferry, visit the island, find unique, hand-crafted gifts for those on your shopping list while also supporting local artists. Win-win-win! I recently took down a show at Evergreen Medical Center in Kirkland, WA. Nine pieces that had been away for over two years! Loading them into my car, I rediscovered a body of work that had been away for too long; I feel inspired to continue this body of work. Where else can I take this? What else can I do with this idea to deepen and extend the work? I must admit, the process of making art has taken a backseat to the projects around my new/old home. When I moved in a little over a year ago, the house was badly in need of TLC. Most of my creative energy has been focused on cleaning, fixing, learning DIY tasks and creating a garden out of an overgrown weedy forest. 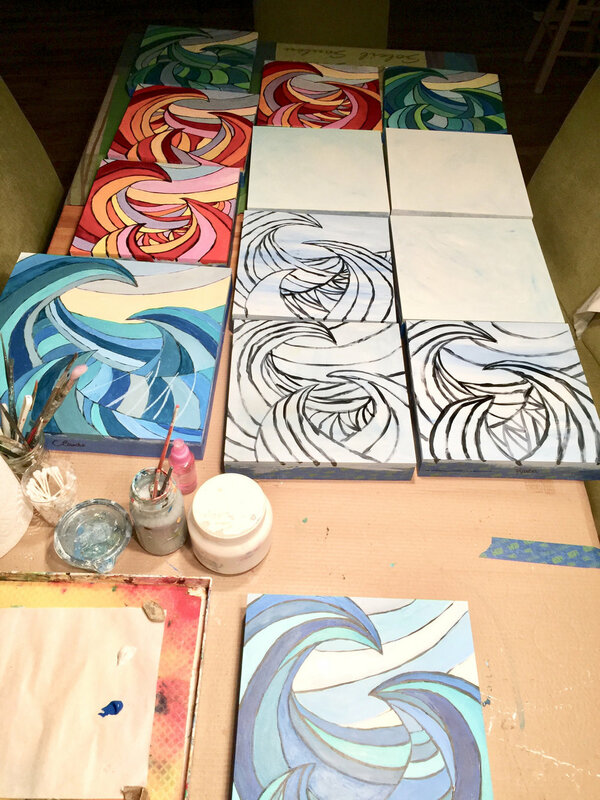 But the bulk of the work is done and it’s time to rev up the studio practice. Stay tuned as the work progresses. Today is the fourth of July, and if you live in the Seattle area, it’s the unofficial start of summer weather. Where you’re pretty sure to see the sun for the next 2-3 months. It’s a rare local who’ll plan an outdoor event prior to the fourth, as the chance of rain (even hail) is not that unlikely! But come the Fourth of July and there’s smooth sailing ahead. As a young child, summer always meant being near the ocean, breathing in the salt air, watching tides come in and go out, running towards the tide pools to discover a poor unsuspecting crab, long salty hair that crunched and begging the grown-ups for ice cream. Summer was freedom and joy. There’s also something quite grand about being in the water, in the waves. Trying to gauge when the wave will break, how powerful the current might be, how far inland the wave might go. At the same time, I was also trying to decide, will I need to dip down underneath it as it passes me because it’s too powerful? Should I attempt to body surf it? Could I jump over it? Or should I just watch the water rise to my shoulders and then let it pass? And so it was with this work that I wanted to recreate the sensation of being in the water, being part of something so different, yet so similar. Watching the colors and shapes endlessly change. Tasting the salt and feeling the movement of the water. Happy fourth of July to all. Here’s to spending time with family and friends, near the water perhaps? Washington State Ferries (WSF) employees were super enthusiastic about the work and love having this high energy, colorful image as part of their day at work. Vendors who worked local coffee/newspaper kiosks expressed enthusiasm as well. Twice, I was asked if I was serving food! While painting, I wore an apron and occasionally stood next to 3 large boxes that took on the appearance of a table if you came in from the parking lot. Both times, there was a look of surprise as I said no, I couldn’t serve them from my ‘table’. Engagement from people of all ages: toddlers, school children, teens, young people, couples with and without children, middle-aged people, older travelers. One man was planning a boat trip to Alaska. Another couple was traveling the US, taking photos and writing a blog. A group of travelers from China, visiting the island for the afternoon. Young women going to a wedding shower. Children coming from Seattle to the island for a field trip. Seattle Sounders and Mariners fans headed to a game. Local friends coming by to show their support. Mothers and daughters going to Seattle for some shopping. People waiting for family visitors to arrive. A group of women going to canvass for their candidate. Artists who have let their art practice go and were reminded to pick it up again. So many different and interesting people. The funniest part of my time at the terminal was the number of people who weren’t sure where to go to board the ferry, or where to buy return tickets (the return trip is free). Thankfully, I knew the answers to those questions. Thank you WSF for the opportunity. Thank you to my backers and friends who supported me financially and emotionally. It was an extraordinary experience I will never forget. I have been asked if I plan on going back to do more work. We’ll see. I have a few ideas in mind, it’s all up to WSF! Friday and Saturday were spent at the Bainbridge Island Ferry Terminal. The most challenging part of this mural so far was figuring out how to ‘connect’ the lines on the different walls. Depending on where you stand (how far back and at what angle), the lines will meet or not meet. I took my best guess and approximated where they were to meet. The second challenge was paint color. Even though I’m using the exact same paint, the lighting between the forward walls and the wall behind the phone/water fountain are very different. The forward walls are lit by a combination of daylight and overhead lights. The rear wall (phone/water fountain) is lit by canned lighting above, adding a yellowish tint to the colors. I found myself taking the same paint color in the can from wall to wall, watching the color change, even though it didn’t. wow! 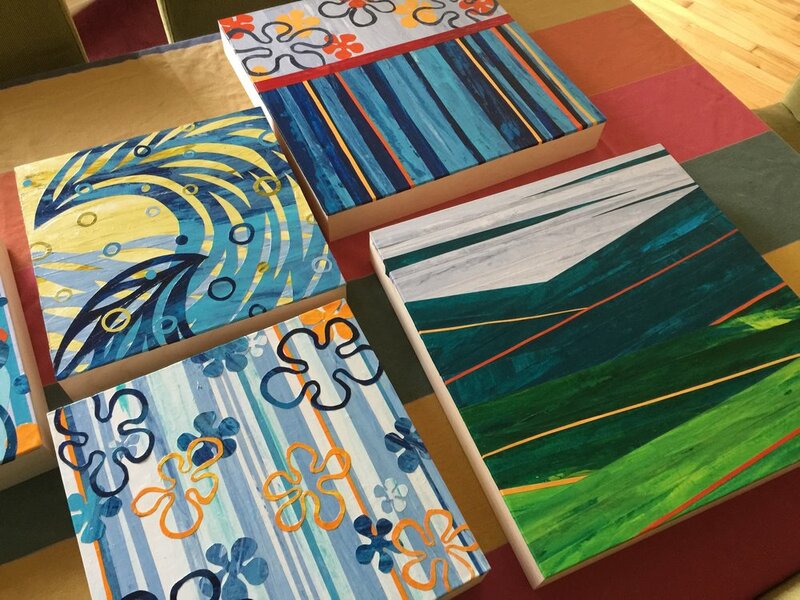 Next painting session is Saturday, May 12th. Stay tuned! On Friday, April 27, I head back to the Bainbridge Island Ferry Terminal to start on Phase 2 of the Mural project. 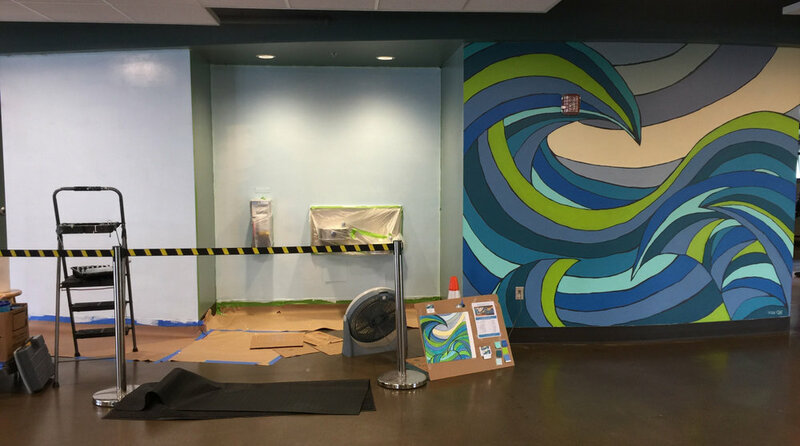 The work will center around painting the rectangular wall to the left of the original mural and perhaps the space in between (phone and water fountains). This work will take place during the month of May, on weekends. Stay tuned as the project unfolds! Wrapping up the original project, I was pleased to be able to finish the backer gifts. Most gifts have been delivered, with a straggler or two. 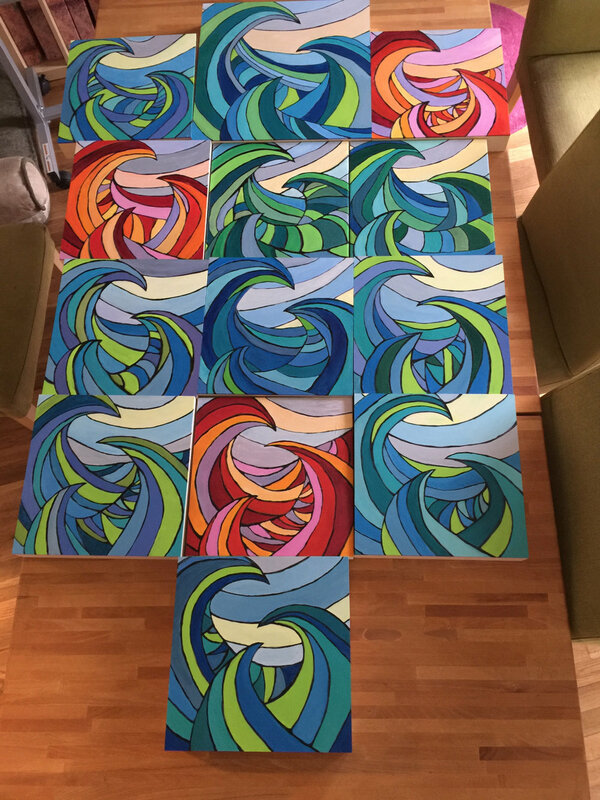 Here’s what the final paintings looked like. There were 13 of them, all original work. My hope is that the work makes you smile when you see it in your home or office. Finally, it was time to call it done, to finish making changes, adjusting colors and lines. It was time to add a signature and call it finished. Phew! A huge thank you to my backers and the Washington State Ferry staff, as they offered so much support on site during the project. Painting in public was also a big plus, as ferry passengers stopped to chat while I worked. The work today was to adjust the colors to ensure cohesion and what I call ‘getting along-ness’. Colors look great out of the tube or can. But once you put them next to each other in a composition, it’s super easy for things to go awry. Highly saturated colors next to each other will often fight for attention, too many strong colors and you don’t know where to look, too many muted colors and your eyes get bored. In the end, I mixed 5 new colors to unify the composition. My favorite conversation was with a 4-5 year old girl who said the painting was beautiful. Tomorrow, I touch up any odd spots and do the line work, which should finish up the project. Also, if you’re in the Bainbridge Island area, the Kitsap Sun published on the project. All content (text and images) on this site is copyrighted 2001- 2018, by Cynthia Lait. Please contact Cynthia Lait for reproduction permission.